What's Chef Ant E. coli ? Our project Chef Ant E. coli is to append abilities to detoxify formaldehyde to Escherichia coli. Following is a simple explanation of our project. If you want more academic explanation, visit Abstract or each device page. Also, since fromaldehyde is mass-produced in factories, it is highly possible to exceed over the permissible amount in the environment. These days, in Japan, the detection of formaldehyde in Tone river became an issue. We planed to create E.coli which removes such a hazardous material, named Chef Ant E.coli. It is appended 3 devices and gets removal ability of formaldehyde. More genetic information about Chef Ant E. coli is available in project abstract. 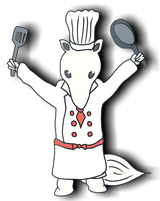 Image of Chef Ant E. coli.